If the kids are at home for more than a weekend then by the 3rd day they demand that we make simple cakes as they call them. They are their favourite recipe to make and it’s so easy to remember that without a cookbook they know exactly we what need every time. But, the best part is decorating afterwards. This isn’t a complex recipe but a simple easy to do with kids boredom busting idea that makes the kids smile and they have a yummy treat they have made themselves afterwards. Start by weighing out the ingredients I like using different scales so that the kids can experience different ways of measuring weight a great little maths activity mixed in with the cooking. Into the mixer the kids tip the margarine and sugar and then mix slowly at first bringing up the speed until they are creamy and light in texture. Then to crack the egg – the best way to get the kids cracking eggs is to do it into a jug – that way if there are any bits of shell you can fish them out before pouring into the mix. Add the eggs and vanilla extract to the bowl and mix again – this recipe is so simple that even if the mixture looks odd it’s fine. Pour in the flour and baking powder and mix to a creamy consistency. Line a muffin tin with 12 cases and put in equal portions into each case. Place in the oven for 12 – 15 minutes until golden brown. Leave to cool and once cooled decorate. 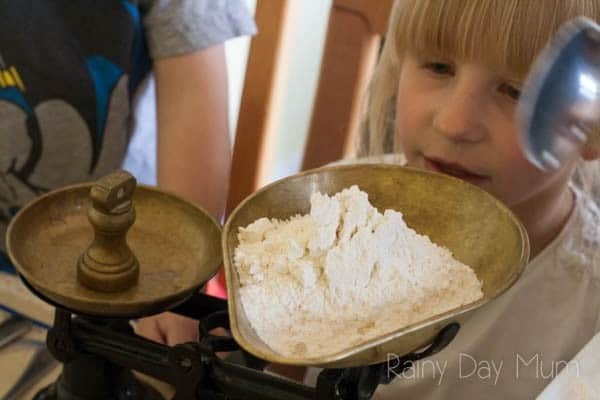 My kids like using a confectionery sugar and water mix and then silver balls or sprinkles – basically what ever we have in the cake decorations box (something that I try and keep stocked up for pulling out when needed). Simple cupcake recipe for kids to make and decorate. Preheat oven to 180C/ 356F. Crack the eggs into a bowl, add the vanilla extract and beat them together. Add the flour and baking powder and mix until it has a creamy consistency. Line a muffin tin with 12 cases and divide the mix equally between the cases. Bake in the oven for 12 - 15 minutes until golden brown. Leave to cool before decorating with confectionery sugar and sprinkles. Each month I will be joining with some other bloggers to give you some recipes for getting the kids cooking in the kitchen – this months theme is all about kids favourites – those recipes that kids love to cook. Do remember to check back next month as we will be sharing some of our favourite recipes to get kids creating their own breakfasts. Decorating the cupcakes is the best part!! I love how simple this recipe is!